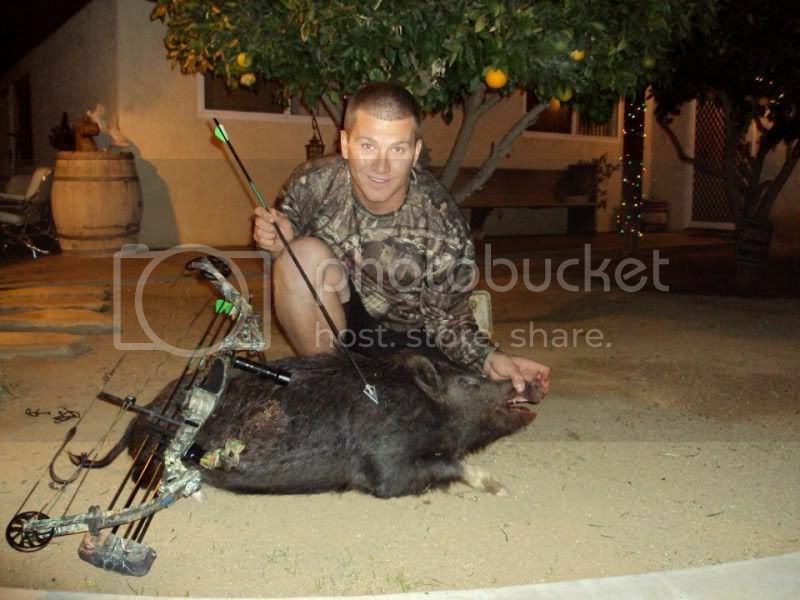 Home › Forums › Types Of Hunting › Hog & Javelina › Public land pork! First post on this sight. Hi guys my name is Chris I live in Newport Beach and weapon of choice is a Bowtech Guardian compound bow, Redhead Carbon fury 6075 arrow with a 125gr black death broadhead by stealforce. Here are some of my trips in the past 2 months. All public land and lots of homework and scouting to get these pigs figured out. they are super spooky and very clever. basically all evening hunts with the pigs moving at the last hour or so of light. I also recentally had an encounter with a Mt. Lion which in trun screwed up my spot. all shots are inside 30 yds and animals recovered within 50yds from the impact point. Awesome hogs! Good eats right there and quite an accomplishment doing it on public land. Nice job! That is sweet! Congrats. I am glad we don't have hogs just for the fact of how invasive they are but at the same time I would love to shoot some hogs sometime. Go get some more! In some places in California there not a bad thing. they really are just another game animal. people complain that they are distroying natural Habitate for the native spieces but if you look at it the same areas that have people complaining are places that have cows and cows distroy just as much if not more natural habitate. places in California like the one im hunting are perfectly in balance. 90% if not more of the people have no clue there even pigs right in there back yard. you really only know they are there is your looking for them. NICE!!!! I just got my 1st pig down on public land in So Cal as well!